Seems like we have a theme for the week... Islamic governments going after bloggers who believe their religion should be compatible with democracy and free speech. Watch Chan'ad Bahraini for updates on first one, now THREE people jailed in Bahrain. Babbling Bahrania is also on the case with the latest about the plight of blogger Ali Abdulemam, plus Mohammed Almosawi and Hussain Yousif, all three of them moderators of Bahrainonline. According to Babbling Bahrania, "This is an arabic site which you can access to get a flavour of the kind of debates. It has tended to be highly critical of the government, although the moderators have always maintained a certain standard of debate which is not abusive or slanderous." Bahrania asks: "if you knew u were going into custody, what would you pack in your suitcase?" Our boys, Ali, Mohammed and Hussain will be forced to face a difficult choice: close BahrainOnline.org, wipe out the database or face SEVERE consequences. Will they stand by their principles and rights to free speech and forsake their future? This is the choice they are facing right now in that interrogation room. Ali was the visionary of this project, Mohammed was the brains, Hussain was the voice. They're identities were never secret. Which one will break under pressure? I'm sure they now realise this is no joke and the government is DEAD serious on closing this site down. How long can it go on clamping down on its people - banning foreign participants to conferences, arresting people collecting signatures for a petition, threatening the closure of political societies, arresting a human rights activist, living on royal whims, blocking websites and now this. Will Bahraini Big Brother do the right thing? Bahrania hopes international attention will make that more likely: "What else can we do? How do we know this isnt just some blogger frenzy and that the authorities are hearing this??" It's great to see Malaysian Blogger Jeff Ooi blogging up a storm, uncowed, after he was taken in for questioning by police on Monday morning local time. For details on what happened see Ethan Zuckerman's post at the Global Voices blog, Curt Hopkins' post at the Committee to Protect Bloggers, and an expression of concern by Reporters Without Borders. As RWB points out, "The Malaysian authorities have previously acted against online publications." One webmaster and journalist for an edgy online news site went to jail for 2 years in 2001. Jeff knocked everybody's socks off here at Harvard last December when he spoke at the Internet & Society conference and inspired us all at the Global Voices workshop (see a report about that conference here). We all hope that if Malaysian authorities know that a lot of people around the world are big Jeff Ooi fans, they'll be less likely to take their attempts at harrassment and intimidation any further. Typepad managed to keep most spam out, but I've been struggling to keep comment and trackback spam out of my WordPress and Movable Type blogs. Trackback spam is especially evil. Netaloid concludes that the online casino operators and their umbrella association are likely to take the matter of the Poker Spamster more seriously if presented with a petition from, hopefully, numours blog owners who’ve been affected by this person/persons over the past few weeks or months. Check it out and sign if you agree. The Committee to Protect Bloggers reports that another Iranian blogger, Mohammad Reza Nasab Abdolahi, was convicted today. On Wednesday, the blog Radio Free Nepal posted these pictures. 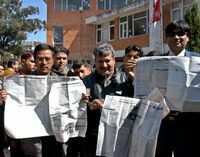 Three editors of the newspaper Bimarsha weekly were summoned for questioning by police after publishing blank editorial pages in the paper: their way of protesting government censorship in the wake of Nepal's recent coup. Nepali journalists face arrest for defying censorship, but they are doing what they can to get the real news out by blogging through Radio Free Nepal. The blog points us to a Human Rights Watch report on atrocities being committed by both government troops and Maoist insurgents. According to the International Crisis Group, Nepal faces an "urgent human rights crisis in Nepal that requires international action." Keep an eye on the RFN blog for firsthand reports from Nepali journalists, blogging anonymously in order to avoid being thrown in jail. 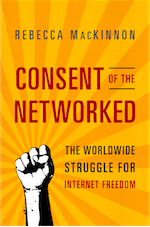 The Online Journalism Review has an article about RFN today. The Committee to Protect Bloggers points to this Reuters story on the conviction of 28-year old Iranian blogger, Arash Sigarchi. His crime? "Insulting" Iran's leaders. The BBC has a report about the dangers of blogging in Iran, plus a story about today's action day. Today is Free Mojtaba and Arash Day in honor of the two Iranian bloggers currently incarcerated by the Iranian government. Read about Arash and Mojtaba. Here is what you can do. With additional contact information. Banners are available at various locations on the Committee to Protect Bloggers blog. We have already had a tremendous response, including encouragement and thanks from bloggers in Iran. Let's make a difference today. Freedom of speech is not a partisan issue, not an issue of culture or ethnicity, it is a bloggers' issue and a human issue. In his latest column, When the Readers Speak Out, Can Anyone Hear Them? NYT obmbudsman Daniel Okrent laments that most letters-to-the editor are never shared with the public, nor are reporters' thoughtful responses to these letters. He suggests this problem could easily be solved on the NYT website by linking reader responses to each article. Mr. Okrent, why not take this a step further? Why not create a feature that enables NYT readers to click on a link somewhere on your site and easily set up their own blog? Set up the system so that every time somebody links to the NYT article that they're criticizing (or praising), that article gets a trackback ping. Then when we read a NYT article on the web, we can click on a link somewhere at the bottom of the page and read all the reader reaction to that piece. This automates the process and makes it unecessary to pay a staffer to sift through and post reader feedback (you could filter for obscenities and such). Individual reporters would also have their own blogs in which they respond to these criticisms and questions. These responses would link automatically to the relevant article through trackbacks. Of course reporters won't have time to respond to everything, but what blogger responds to all the trackbacks, comments and e-mails they get? You do what you can, and respond to groups of criticisms that fall under similar themes. People will appreciate it and gain a better understanding of why you wrote what you did. You can also deal with corrections in this way... and I bet a lot of story ideas and leads would emerge in the process.